Rabbi and cabalist; died at Jerusalem in 1813. He was one of the Ḥasidic followers of Israel Ba'al Shem, and after he had been rabbi at five different towns, among them Moghilef and Czernowitz, he settled in Jerusalem. Ḥayyim was the author of: "Siddure shel Shabbat," cabalistic homilies on Sabbatical subjects, Poryck, 1818; "Be'er Mayim Ḥayyim," novellæ on the Pentateuch, in two parts, Czernowitz, pt. i. 1820, pt. ii. 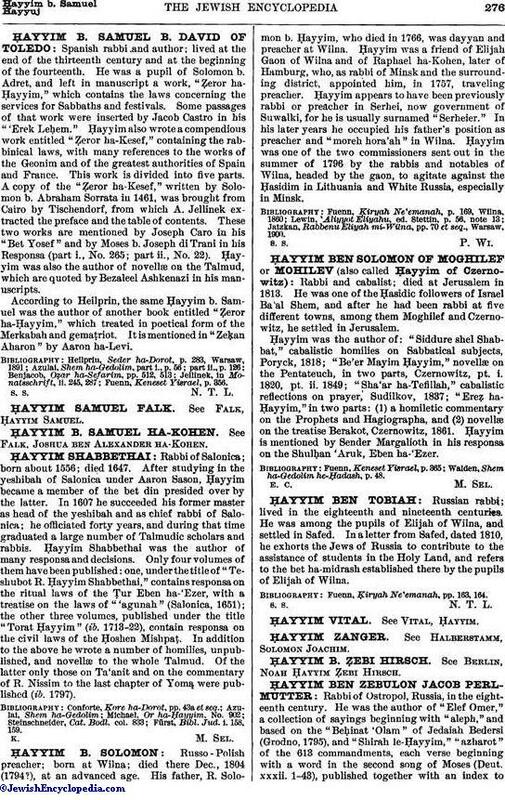 1849; "Sha'ar ha-Tefillah," cabalistic reflections on prayer, Sudilkov, 1837; "Ereẓ ha-Ḥayyim," in two parts: (1) a homiletic commentary on the Prophets and Hagiographa, and (2) novellæ on the treatise Berakot, Czernowitz, 1861. Ḥayyim is mentioned by Sender Margalioth in his responsa on the Shulḥan 'Aruk, Eben ha-'Ezer. Walden, Shem ha-Gedolim he-Ḥadash, p. 48.